The potential harm to coral reefs caused by sunscreen. Everyone knows that pollution—petroleum products, plastic, sewage, etc.—is harmful to coral reefs.Fewer people know that something we do every day (or should do) is also polluting lakes and oceans and potentially harming coral reefs. 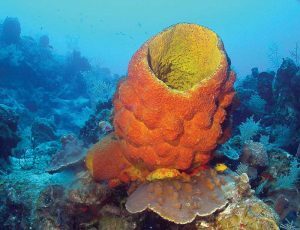 More than half of all sunscreens contain the chemicals oxybenzone and octinoxate, which have been shown to be harmful to corals in very low concentrations. According to the US National Park Service, between 4,000 and 6,000 TONS of sunscreen enter reef areas every year. Other scientists estimate closer to 14,000 tons, including wastewater run-off. That’s a lot of sunscreen carrying toxic ingredients. They also estimate that 90% of diving and snorkeling activities take place on just 10% of the world’s reefs. So, all that sunscreen is concentrated in a very small reef area. You slather on the sunscreen and then jump into the water. And it’s not just oxybenzone and octinoxate that’s a concern, other common ingredients in sunscreens and personal care items can also cause problems. These include parabens, nano-particles, cinnamates, benzophenones and a camphor derivative. This beautiful display of thriving coral off South Caicos (post-Hurricanes Irma and Maria!) is an example of what we don’t want to lose by using chemical sunscreens. So what’s the problem with sunscreens containing these ingredients? A 2016 study published in the scientific journal, Archives of Environmental Contamination and Toxicology, demonstrated that oxybenzones have several adverse effects on coral polyps, are highly toxic to the coral larvae (called planula) and are a skeletal endocrine disruptor effecting the hormones leading to abnormal coral growth and deformities in baby coral. Oxybenzone also makes corals more susceptible to bleaching, which occurs when coral reefs are exposed to extreme water temperatures (generally extended exposure to temperatures of 84º Fahrenheit or higher) and other stressors. Coral bleaching occurs when the symbiotic micro-organisms that live in coral polyps, called zooxanthellae, leave the coral. They provide a large portion of the food that coral needs to survive—as well as their unique and beautiful colors. If the zooxanthellae don’t return to the coral quickly enough, the coral turns white and dies. Another study published in 2015 also found similar impacts of sunscreens on corals. They tested the waters at popular tourist destinations and found oxybenzone levels ranging as high as 4,200 parts per trillion in Hawaii to 1,300 parts per billion in Trunk Bay, Virgin Islands! The same study also demonstrated acute toxicity to coral larvae with oxybenzone as low as 62 parts per trillion. The legislature in the State of Hawaii is so concerned about this issue that they recently passed legislation that would ban the distribution of sunscreens containing oxybenzone and another similar compound called octinoxate. If signed by the governor of Hawaii, the law will go into effect on January 1, 2021. Other tropical destinations are quickly following Hawaii’s lead. After the state banned the sale of oxybenzone- and octinoxate-containing sunscreens, the Dutch island of Bonaire voted unanimously to enact similar legislation. What is an environmentally-conscious person to do? Exposure to the sun’s harmful rays can cause premature skin aging and even cancer. One step people can take now is to wear clothing that has an SPF sun-blocking factor to minimize the amount of sunscreen needed.Long-sleeved rash guards often offer protection of up to SPF 50. Wearing such garments and an SPF-rated hat can reduce the need to use sunscreen on a major portion of a person’s body, as only the hands and face remain to be exposed to the sun. Another option is to use a reef-safe sunscreen. These generally contain a mineral sunblock such as titanium oxide or titanium dioxide. Chemical sunscreen filters like oxybenzone, octinoxate and avobenzone are often lurking in the product while promoting the minerals on the front, so it is important to flip the bottle over and read the ingredient listings. Well formulated mineral sunscreens are just as effective as the chemical ones, but are biodegradable and won’t harm the coral reef. One such brand is Stream2Sea (www.Stream2Sea.com), which has been tested for aquatic safety and developed by a cosmetic chemist who is also an avid scuba diver living in Florida. You can download their “Ingredients to Avoid” card at https://stream2sea.com/ingredients-to-avoid. The Turks & Caicos Reef Fund, along with the Turks & Caicos Swim Federation and other groups are beginning a lobbying effort to encourage the TCI Government to follow Hawaii and Bonaire’s lead and ban the distribution of the oxybenzone and related sunscreen products to protect the coral reefs which form the basis of the vast majority of the local economy. The coral reefs around the world are under tremendous pressure from numerous factors including climate change, pollution from land-based development and ocean acidification. Those issues are much more difficult to resolve—switching from a toxic sunscreen to a reef-safe option is an easy step that can make a significant difference.